Heritage Talks: "Anishinabe Heritage of the Outaouais." It was standing room only at the Wakefield Community Centre for the 5th in QAHN's ongoing series of "Heritage Talks." 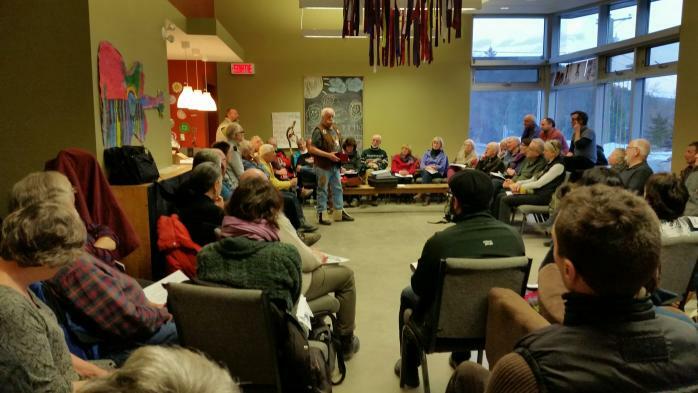 This event featured guest speakers Chief Roger Fleury and Wes Darou, and drew a diverse group to hear about Anishinabe heritage in the Gatineau Valley. One participant reported that "from my perspective it was a game-changer or breakthrough... it was wonderful to attend a heritage event where there were no more seats! This, in itself, supports my conclusion that Canadians are interested in learning and engaging more with respect to Indigenous issues."